- Stocks will typically channel 65-70% of the time. - There are essentially three types of channels; Ascending, Descending and Sideways. - The channel is comprised of two parallel trend lines which define support and resistance. - The trading opportunity is as a result of buying the bounce off the lower trend line and selling the resistance. 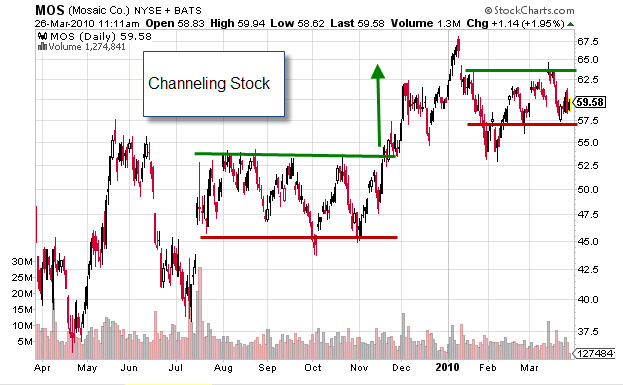 - Channeling stocks as a continuation pattern occur as the stock trends and then consolidates for a period of time, only to eventually break out to resume the prior trend. - Ascending Channels are usually embedded in a broader downtrend and act as a respite to the primary downtrend. - Accordingly, Descending Channels are a respite in a broader uptrend and will more often than not resume the initial bullish trend after channeling. - Sideways Channels are considered consolidations before resuming the original trend. - The investment community recognizes that stocks neither go directly up nor down without pause. - A majority of trading activity resides in channels as supply and demand play “tug of war”. - Eventually traders will push the stock out of the range. - The quality of the breakout/breakdown move should be measured by the investor participation as evidenced by increased volume. - The opportunity to make money with channeling stocks are as a result of two approaches: 1) buy on the bounce off of the lower trend line and sell at the top of the channel at resistance and 2) Play the breakout/breakdown out of the channel. Are clouds looming on the horizon? The Symmetrical Triangle is a continuation pattern that is comprised of two symmetrically converging trend lines. The continuation will normally be in the direction of the prior trend, although at times the pattern can reverse the trend. 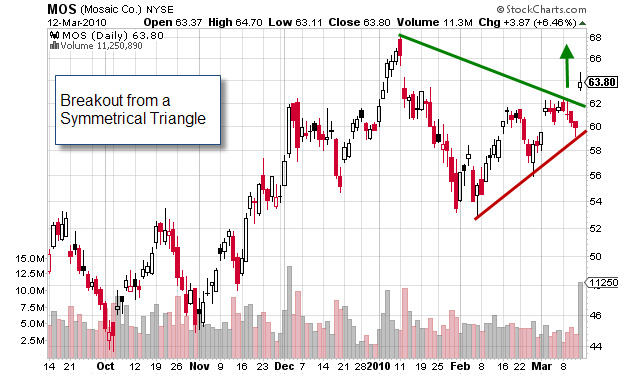 The breakout usually occurs prior to the triangle reaching its apex and is strongest if that is the case. 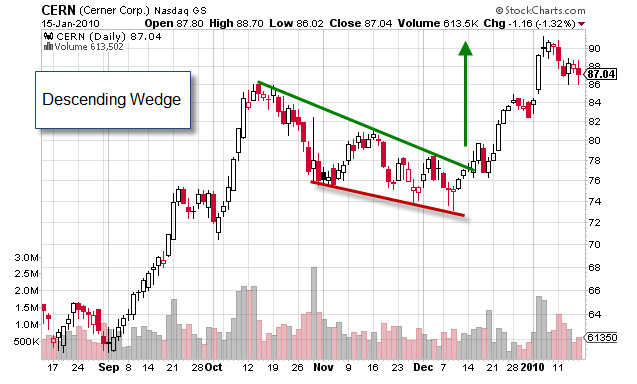 The target is the trend line breakout/breakdown plus the length of the widest part of the triangle. After the stock has moved either up or down relatively quickly and with increased volume, the stock then begins a period of pause as the stock moves sideways or with a slight retrace against the trend. The initial trading in the period of pause consists of a wider amplitude and narrows as the upper and lower trend lines converge symmetrically. The buyers at the top of the first peak were victims of buying from the “smart money” as they sold to the “not so smart money” at the top of the trading range. These unfortunate buyers will usually hold, refusing to take a loss and waiting for the opportunity to unload the stock at a break even. When that opportunity presents itself, at the second top, selling pressure increases and drives the stock lower. Other knowledgeable traders who know that the “Double Top” will present an opportunity to short, will do so thereby increasing the velocity downward move. - The inverse of a Cup & Handle Chart Pattern. 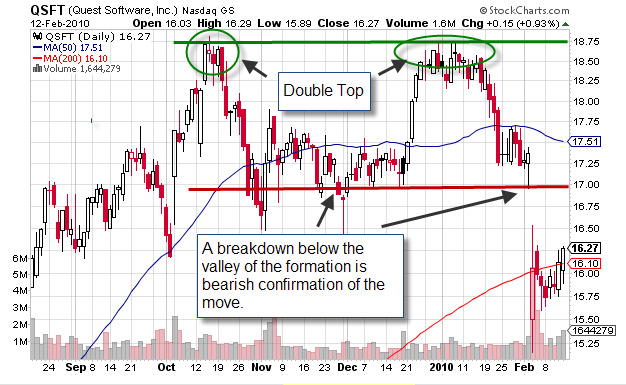 -The stock bounces off of a support level and moves higher on unremarkable volume. 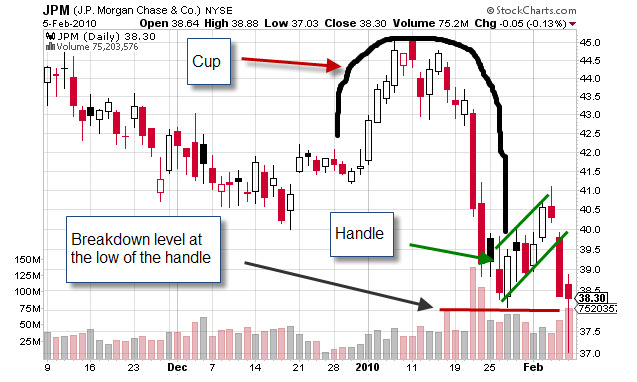 - A “Rounded Top” forms and then subsequently moves lower on increasing volume producing “The Cup”. - The pattern is completed when a Bear Flag forms producing the handle. - The breakdown occurs when the stock breaks the low of the handle on increasing volume. Cash is king! Liquidity in the form of cash tells us that the company can meet its obligations. The Cash Flow Statement is the third and last statement that we will touch upon. The statement is filed quarterly and year over year in concert with the Profit and Loss and Balance Sheet. The Cash Flow Statement is a measure of incoming and outgoing cash from its business operations for a specific point in time. The statement further defines the cash flow of the company that is indicated on the Balance Sheet. There are two methods of accounting that are used 1) accrual and 2) cash. Most companies use the accrual method which accounts for goods delivered as sales regardless of whether they have been paid for or not. The outstanding balance is shown on the Profit and Loss Statement under accounts receivable. Well, it appears we are getting our pullback as we had expected would happen. We are certainly grateful that we were generously hedged as indicated in last week’s newsletter. This decline may have taken others by surprise but we were ready for it. Our positions are now biased bearish and delta negative. 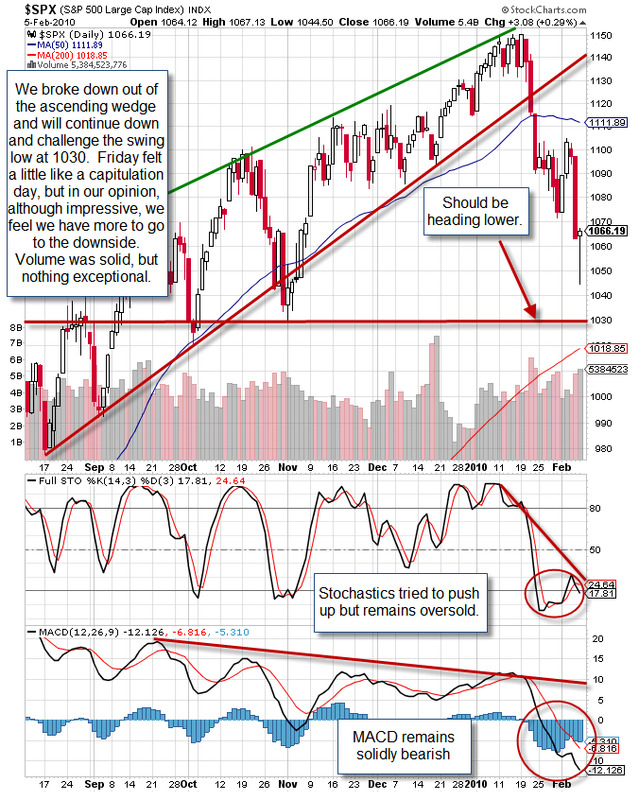 The task is now to determine likely targets for the down move. It is difficult to accurately determine the magnitude and duration of a move such as this one. 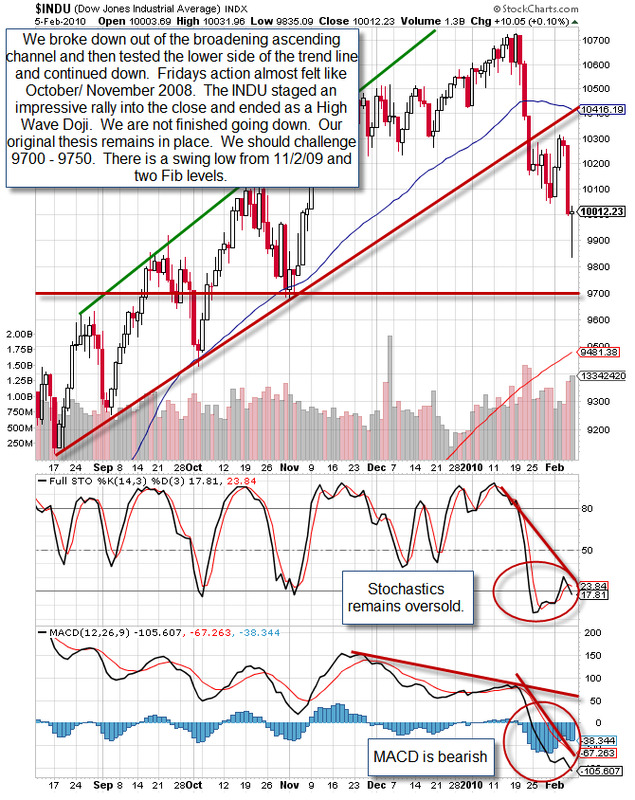 The place to begin is to identify where a confluence of indicators exists. These are areas where several data points line up to tell us a similar story. 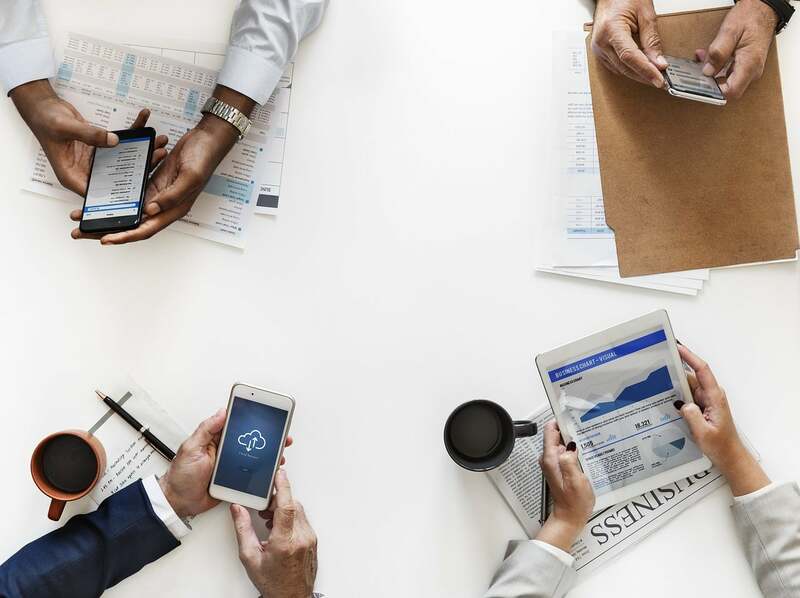 While this does not mean that the market is going to cooperate, having a system is important in order to remain disciplined in your decision-making. 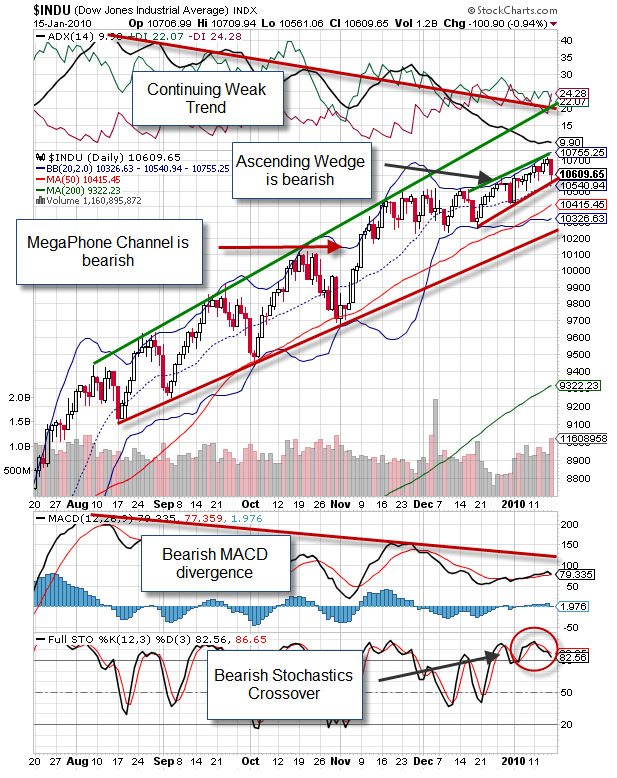 It is healthy that the stock market has a pullback. We are long-term bullish, and retracements such as these are crucial to long-term strength. We will simply follow the correction and look to profit from it with bearish strategies, such as bear calls, long puts as well more advanced strategies which we teach at MarketTamer.com. I am reminded of the analogy that the market goes up like an escalator and down like an elevator. The last three trading days certainly support that truism. 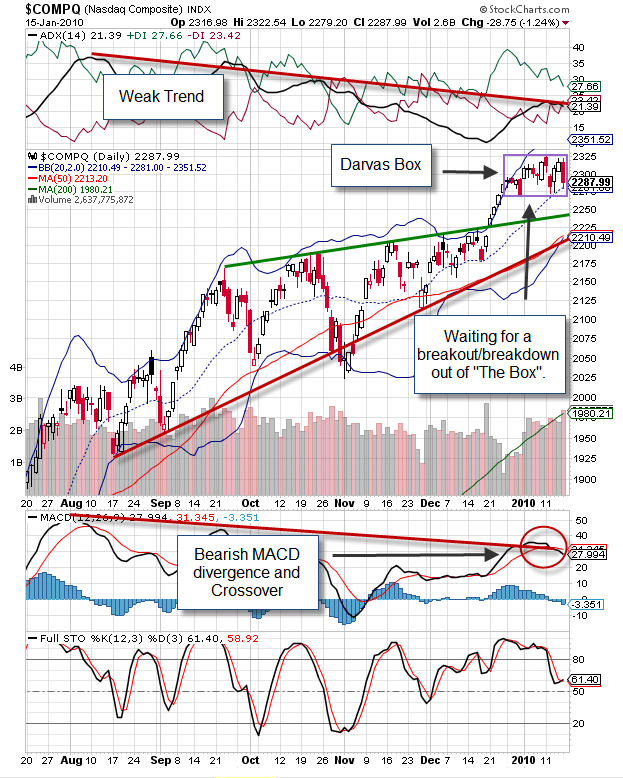 As the market approaches target levels noted in the charts, we will begin to take close note of how it reacts at those key levels. Typically, you will see the indexes put in narrower range trading days with less volume at support. Don’t be fooled! The market can do this several times on the way down. If the market begins to stall and trade sideways, it is tempting to remove hedging, only to be surprised by subsequent whipsaws. The safest approach is to wait for upside confirmation before determining that the market has found a bottom. You may miss the exact turn, but don’t let that bother you – safety first is the rule! Do not underestimate the market’s ability to follow through to the downside. Momentum can be a freight train and you don’t want to step in front of it. Just hop on board and ride it to the end of the line. · This is a falling and converging channel pattern. It looks like the beginnings of a triangle as both trend lines are falling and converging. · The lower trend line is putting in lower lows, but not at the pace of the upper trend line. 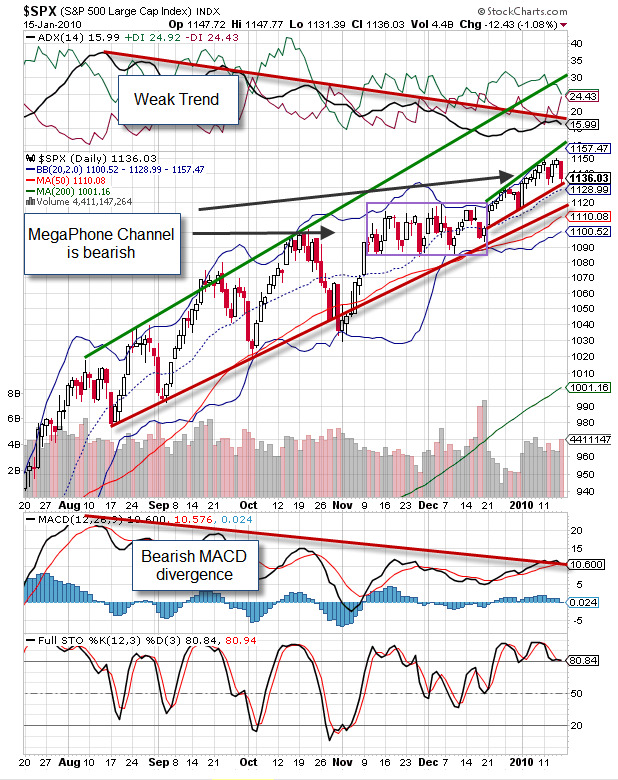 The pattern has bullish implications as the stock will usually break to the upside out of the channel. 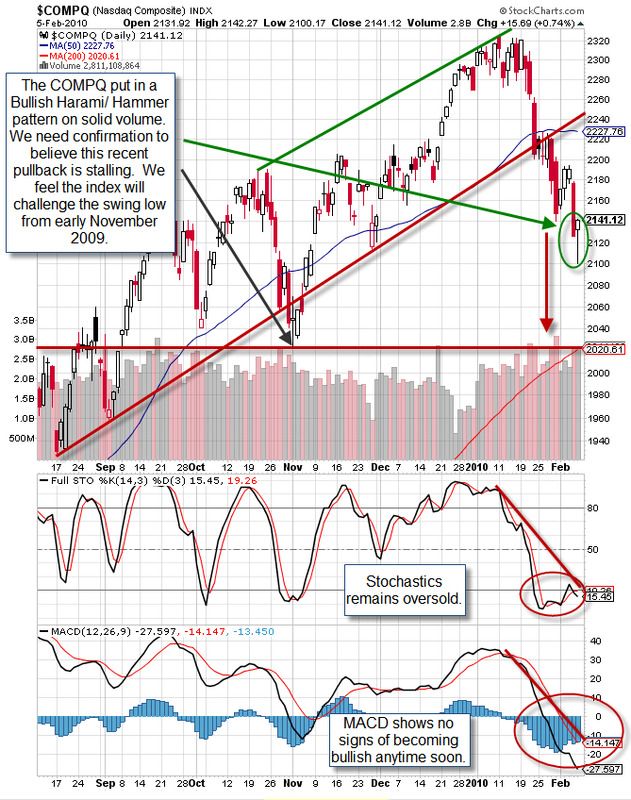 · The pattern can be found in both bullish and bearish markets. · When in a bearish market, the pattern is defined as a reversal pattern. · When in a bullish market, the pattern is a continuation pattern. 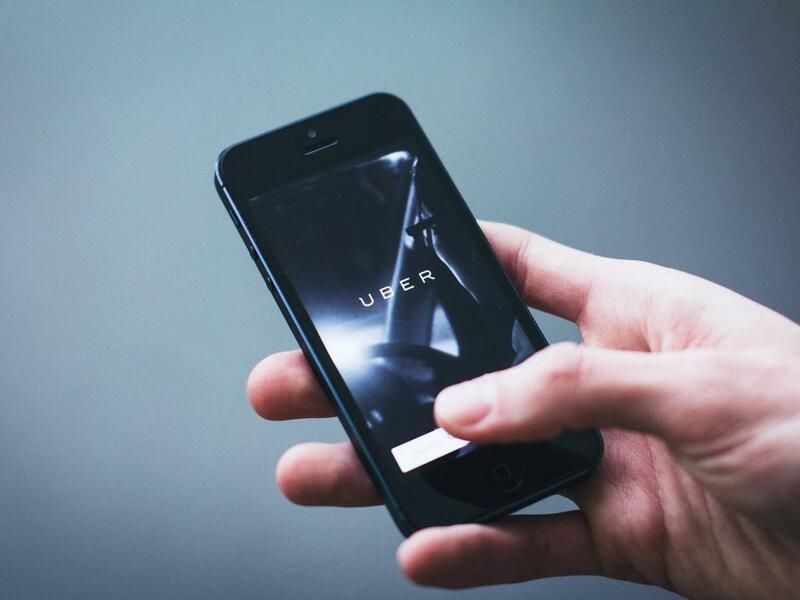 · The stock is putting in lower lows, but at a slower rate than the highs. · Volume is diminishing indicating a lack of conviction in driving the stock lower. · When the stock breaks the upper trend line it will usually be on increased volume as the stock breaks out of the channel to the upside.